Thank you for your interest in Type40 Low Profile Belt Conveyor. We will be happy to discuss the pricing in more detail with you please fill in your details below and somebody will contcat you back with a quote. Alternatively please call us on 01772 690656 and please reference our part number - Type40 Low Profile Belt Conveyor. The low cost, low profile Type40 belt conveyor is constructed with 40mm deep slotted aluminium profiles. The modular components that complement the aluminium system allow for fast conveyor build and for easy changes to future design if the customer requires. 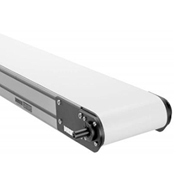 Type40 belt conveyors are manufactured from 40X40mm extruded anodised aluminium profile. Under the belt the support comes from a folded modular galvanised steel skid bed. These conveyors have 40mm diameter drive and tail roller as standard and are driven by an external shaft mounted geared motor. There is an option for a centre drive. These conveyors have a weight capacity of up to 5Kg per metre. The belt is fully guided using a tracking cleat under the belt. There is only an end drive option as standard with this economy system using 3phase motors as standard. Adjustable speed controllers, stands and side guides are all available as options. • A low cost conveying option. • Conveyor frame constructed with slotted aluminium profiles compatible with popular 8mm slotted systems. • Many modular components compliment the aluminium system. • Rigid under belt the support. • Weight capacity up to 5Kg per metre. • No belt tracking needed as belt uses a tracking cleat under the belt.